Monday Morning MD: Andy Dalton season over? One misguided play may have changed a season. When Andy Dalton broke his thumb making a tackle on an interception, the Bengals went from a possible #1 seed to just trying to hang on. The Bengals signal caller didn’t even know he was hurt until he tried to grip a football. Any throwing hand thumb injury is devastating for a QB since you can’t throw the ball if you can’t grip a ball. By video, the specific injury is hard to pin down as one cannot definitively see the position of his thumb when it contacts the interceptor’s knee. Although a fracture has been confirmed, the question remains which bone and if it is displaced. The best-case scenario is a non-displaced, stable tip fracture where Dalton might be able to play in 2-4 weeks. The worst-case scenario (and the worry here) is a Bennett’s fracture/dislocation at the carpometacarpal joint. This would mean surgery and end of his season, unless his team has a deep playoff run. Ryan Fitzpatrick recently played through his thumb injury and even had surgery without missing a game, but that was on his non-dominant side. Dalton was having a stellar year but has never won a playoff game. Now it appears that his team will have to get there and win a post-season game without their star QB in order to have a chance to get him back. Thomas Rawls had breakout performances as he stepped in for Marshawn Lynch. Now Beast Mode needs to hurry to get back to take Rawls’ spot. Rawls was announced to have broken his ankle and has ligament damage. Although surgery has not been announced yet, that is the likely outcome when bones and ligaments are injured. Even if the Seahawks extended their season to play in the Super Bowl, Rawls would not be ready to return. Lynch is only two and a half weeks from his sports hernia type surgery. Typical recovery is six weeks. Although Zach Ertz made it back in four weeks, Arian Foster took over seven weeks. It will be unlikely that Lynch can step right in yet. Matt Hasselbeck has filled in admirably while Andrew Luck recovers from a kidney laceration. Hasselbeck was injured last week and left this week’s game with a rib issue. Next week will be the sixth post injury week for Luck. My estimation for return was always at 6-8 weeks. If Hasselbeck can’t play and Luck is not ready, the duty will fall to Charlie Whitehurst to lead the Colts in their AFC South first-place showdown against the Texans, who also may be starting their back-up T.J. Yates as Brian Hoyer did not finish his game either. Rob Gronkowski returned to catch a touchdown pass when just two weeks ago most initially thought his season was over. Gronk has his knee brace back on and will likely keep it on for the remainder of the season. Danny Ammendola appeared more fluid as he plays his way out of his presumed PCL sprain. Julian Edelman practiced late last week. Although I doubt he is on the verge of playing, it still is a good sign of progress. I still anticipate the recovery to be 6-8 weeks, especially with his cutting and underneath route. Greg Olsen exited the game on a scary looking knee injury. By my analysis, the injury looked bad, but in reality is not bad. It was termed “not serious”. The belief is that he could have returned but was held out as a precaution with the blowout. Jonathan Stewart injured his foot. No video was seen but reportedly he was held out as a precaution too. Bene Benwickere fractured his leg. He likely will need surgery in the form of a rod. T.J. Yeldon injured his ankle in the first half and then his knee in the second half. His status is to be determined. J.J. Watt played with a club for his fractured hand. He seemed to play well but the injury may have kept him from dominating like he often does. Kam Chancellor was reported to have a tailbone injury. These can be quite painful but no surgery or treatment is needed. His return will be based on pain tolerance. Sam Shields fell awkwardly out of bounds and the TV broadcast questioned an arm injury. By video, the arm was fine and he hit his temple on the ground. He was ruled out with a concussion. Devin McCourty hopes to escape major injury. 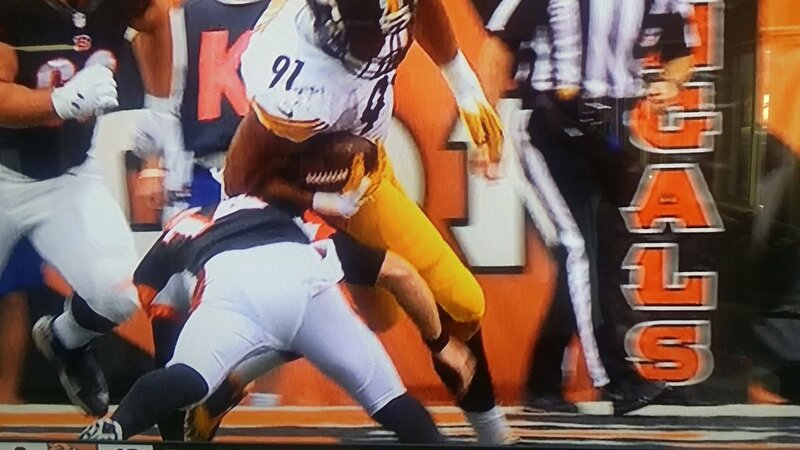 By video, it seems to be a mild high ankle type sprain. The position of his foot and leg save him as he is rolled up on from behind. LeGarrett Blount appears to have a posterior hip injury. By video, there is no indication for major trauma and hopefully it just involves a muscle injury. Dominque Easley seemed to have a quad strain by video. A thigh injury was confirmed and he tried to keep it loose on the stationary bike. Although the injury may be mild, it may affect him some moving forward. The quad is vital for his bull rush and holding his ground. Devin Smith appeared to go down with a non-contact knee injury. The worry for the Jets WR is his ACL and he has a MRI pending. Brian Hartline broke his collarbone and will have surgery. His season is obviously over. If the current trend holds up, the Giants are on pace to be the league worst for injuries for the third season in a row. This would be unprecedented. I know the Giants have a top head team physician and head athletic trainer. Often injuries are bad luck; however, three seasons in a row will have the Giants doing a lot of offseason analysis on why this continues to happen. Medical licenses are granted by individual states. When a team ATC or doctor travels to another state, technically they are not licensed to provide care there. This is not just a NFL issue but one for colleges and high schools as well. H.R. 921 would provide some legal protection and reciprocity when travelling to care for one’s team. It just makes sense to formally allow what has been happening for decades. I have enjoyed my little over two years on twitter. Reaching 40k followers this weekend, I want to all of you for following and asking great questions. Andre Ellignton turf toe does have him at an extended absence as first thought. After five weeks inactive, Carlos Hyde was finally was placed on IR and likely needs surgery. As expected, Kevin White’s season is officially over as the Bears choose not to activate him off PUP with his tibia stress fracture. Greg Olson’s injury is fortunately mild despite initial fears. Dominque Easley thigh injury was confirmed. Sam Shields arm was OK, but he is in the concussion protocol. This takes last week’s running record of 114-7 to 120-7 or 94.5% for 2015.